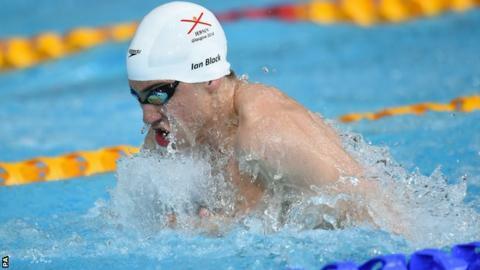 Ian Black has been selected as part of Jersey's 17-strong swimming squad for this summer's Island Games. The multi medal-winner is joined in the men's squad by captain Tom Gallichan while Susie Phillips skippers the women's team on her Games debut. Former gold medallist Emily Bashforth has decided not to continue swimming competitively, so has been left out. "We're very lucky to have Ian Black back on board," coach Nathan Jegou told BBC Radio Jersey. "Him and Tom (Gallichan) were thinking about their futures after the Commonwealth Games but the opportunity to do a home Island Games was too good to pass." Jersey topped the swimming medals table in Bermuda at the 2013 Games. However, this time around they will have to cope without Bashforth, one of their star performers from two years ago. "We've known for some time she wasn't going to continue and we've respected her decision not to be part of the team," added Jegou. "The girls who've made the team have an opportunity to step up and be that star swimmer." There will be Island Games debuts for the men's quartet of Harry Shalamon, Nathan Corrigan, Cameron Swart and Tom Cairns. As well as Phillips, Holly Hughes, Lillie Godden and Olivia Pollard will make their first Games appearances in the women's squad. Cameron Donaldson, Giovanni Guarino, Garth Jackson, Gemma Atherley, Danielle Edwards, Beckie Scaife and Beth Cummings round off Jersey's team of 17.